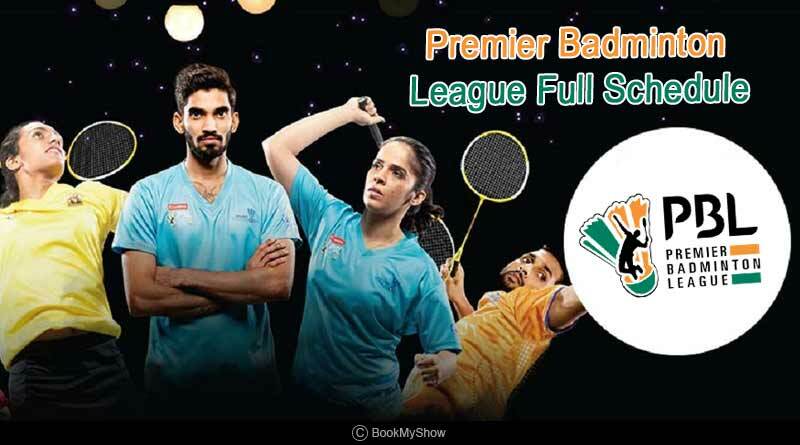 Here is the Premier Badminton League 2018-19 Full Schedule. With the fourth edition of the world’s marquee badminton club tournament underway with a set of stars competing under nine franchisees for a shot at walking away with the coveted trophy under their arms, we bring to you the Premier Badminton League 2018-19 Full Schedule. The 23 days engrossing and enthralling event will see nine teams, the Ahmedabad Smash Masters, Awadhe Warriors, Bengaluru Raptors, Chennai Smashers, Delhi Dashers, Hyderabad Hunters, Mumbai Rockets, North Eastern Warriors and Pune 7 Aces play out a total of 30 matches. PBL 4 will be a five-city event with the inaugural matches slated to be held in Mumbai. The teams will then move on to Hyderabad, Pune, and Ahmedabad before the final round of matches, including the semi-finals and the final, will be played in Bangalore. The matches will begin at 4:00 pm daily starting 23rd December with the second set of matches being played at 7:00 pm, Indian timing. The semi-finals are penciled in for 11th and 12th January before the culminating match on 13th January 2019. Star Sports holds the right of the world’s one and only such tournament and will be airing the matches live on Star Sports 1/HD.